President Pranab Mukherjee on Sunday urged the people to support the government's mission to make India a cashless society. "I urge all citizens to extend their unstinted support to the mission of a less cash India. All efforts of the government will achieve their end only if people were to adopt them proactively," the President said. 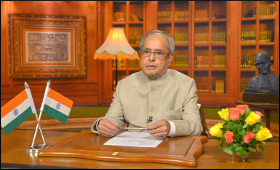 Mukherjee was speaking on the occasion of the 100th mega draw of lots for Lucky Grahak Yojana and Digi Dhan Vyapar Yojana at Rashtrapati Bhavan. "India has a long way to go to become a cashless society. Presently, we remain primarily a cash-based economy with about 95 percent of the personal consumption and 86 percent of all transactions being in cash," President Mukherjee said. Appreciating the government initiatives, he said: "It is necessary to reduce cash in circulation and impart greater urgency to promoting secure digital payment methods to ensure greater transparency." Calling the Aadhaar card a watershed event in the development story of India, President Mukherjee said: "Aadhaar enabled payment system has made digital payments possible for even those section of the population who may not have mobile phones." "Launch of BHIM has demystified the digital payments and brought it within the grasp of every citizen," he said while discussing the new modes of digital payments which are being developed for making payments easier. He complimented the government for the initiatives, for promoting the culture of digital payment in the country. The government launched the Lucky Grahak Yojana for consumers and Digi Dhan Vyapar Yojana for merchants on December 25, 2016, in order to promote and encourage digital transactions. These schemes are being implemented by the National Payment Corporation of India (NPCI). The Lucky Grahak Yojana rewards Rs 1,000 daily to 15,000 customers undertaking digital transactions. Weekly prizes up to Rs 1 lakh for consumers and Rs 50,000 for merchants are given. As on March 30, 2017, 13.5 lakh consumers and 79,519 merchants have received prizes under these schemes.